Like the idea of a simpler life? Want to live well and travel on a budget, now and in your retirement? Join me in my journey to explore the possibilities. We’ll take some detours, but we’ll always come back to the basics. Bigger isn’t better. Tiny is trending. The irony of small homes is that they often have large yards. Lots of folks drawn to tiny houses are also drawn to rural settings. The outdoors becomes an extension of the house: a shady grove becomes a living room; the woods become a playroom; a field becomes a kitchen. And gardens abound. Growing your own food and flowers is one of the joys of lots of outdoor space. But since downsizing in retirement often means smaller yards, I’ve been thinking about tiny gardening. Tiny yards, or even urban dwellings, can offer a chance to get dirt under your nails. When I lived in New Hampshire, where the soil was a rich, black loam, our house had a good-sized yard. But we shared it with another family, so garden space was limited. I read up on intensive gardening, which relies on close spacing, companion planting and deep, rich soil. In an eight foot by five foot raised bed, I grew enough tomatoes, zucchini, Swiss chard and green beans to last all year. And that’s in a three-month growing season. One year we canned 50 jars of tomatoes and, boy, did they taste good in the middle of winter. Although I didn’t know it at the time, while I was planting my first New Hampshire garden in 1981, Mel Bartholomew was introducing a creative version of intensive gardening in his book, Square Foot Gardening. 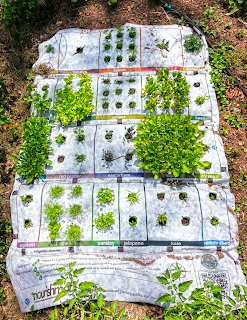 The method fits more produce in less space by avoiding rows and planting in four foot squares. It’s hard to get an original copy now, but you can order All New Square Foot Gardening (2006) here or find it on eBay. If you don’t have any yard space at all, container gardening on a patio, balcony or porch, including hanging baskets, will supplement veggies you buy. In a warm climate, succession planning will give you different harvests all year long. And you don’t have to be in a house or stay in one place to garden. 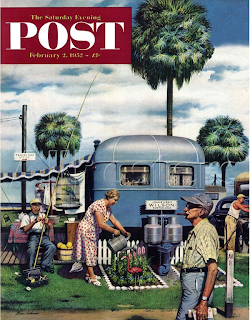 See here for a fun Facebook page devoted to trailer park gardening. That’s where I learned about Bacsac, a French company that came up with a weightless, portable bag for tiny, mobile gardening. To do the same on the cheap, use some ubiquitous cloth grocery bags set in a galvanized hog pan ($4 at hardware or feed stores). Tiny gardening was in the news earlier this month when NPR did a story called Why Micro-Gardening Could Go Big. It is a great read on city gardening, helping people in urban areas with limited resources to grow their own food and the Kickstarter campaign for the new Nourishmat. 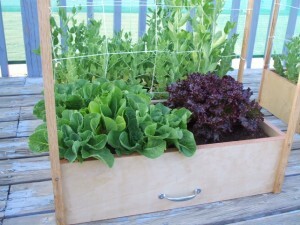 It also has links to stories on window farming and indoor gardening. Read it here. What are your ideas for tiny gardening? Baby Boomers are the original trenders. For 50 years, our sheer numbers have pushed our concerns and lifestyles into the daily headlines. Now older boomers are retiring in droves, and changing the face of post-work living. Many want a simpler life, smaller homes and affordable travel. No wonder tiny is trending. 2017 Dawn Langton. Powered by Blogger.